ListBox Neo is an offline Programme schedule creation and playlist editor. The perfect tool for schedule creation and editing with clip trimmer for simple programme editing. ListBox Neo provides all necessary editing facilities for convenient playlist creation. You will find all expected features such as searching, cut/copy/paste, multi-selection editing, ordering facilities, playlist printing, and last but not least - multi-level undo/redo. Simple clip editing tools are provided within the integrated clip trimmer. 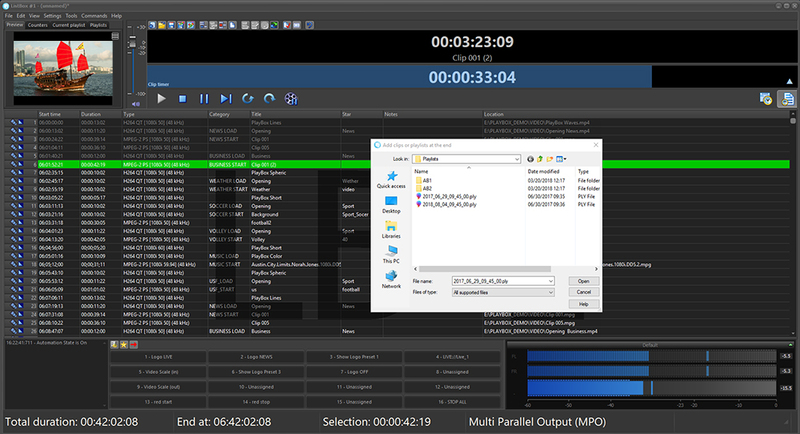 It allows discarding unnecessary footage, clip splitting and last-minute order reversal within the same clip. Forget about returning the clip back to the editing suite - no need and no time! You can even edit the on-air playlist, AirBox Neo will automatically reload the new playlist on the next event. ListBox Neo imports traffic logs from third-party scheduling and traffic systems. This is achieved by using our universal tab-delimited and comma separated values (CSV) and flat fixed-width text import engine. ListBox Neo does not require expensive hardware or ultra-fast workstations, thus avoiding unnecessary expenses. All content previewing and editing is done by the software itself. No need to learn from scratch. ListBox Neo user interface looks quite familiar as a standard Windows software. Most users start instantly working with it even without reading the User's Manual. Currently edited playlist can be played back on PC monitor for preview purposes. ListBox Neo is an offline schedule editor, providing sophisticated editing facilities such as text searching, clip copying/pasting, schedule printing and etc. It is the main tool for the Program Editors, enabling them to create and edit schedules many days and weeks in advance. No special server or hardware is required. ListBox Neo runs flawlessly even on a notebook, even with software-based trimming and previewing.